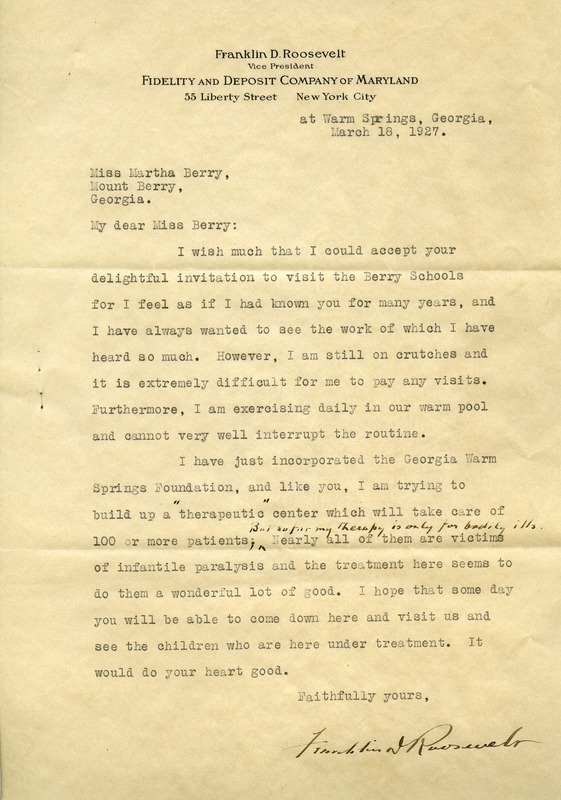 Franklin D. Roosevelt writes to Martha Berry to explain his regret that he cannot visit the Berry Schools because he is still on crutches, which makes it difficult for him to travel. He explains his plans for a "therapeutic" center for victims of infantile paralysis. Mr. Franklin D. Roosevelt, “Letter to Martha Berry from Franklin D. Roosevelt.” Martha Berry Digital Archive. Eds. Schlitz, Stephanie A., Meg Ratliff, Chelsea Risley, et al. Mount Berry: Berry College, 2012. accessed April 24, 2019, https://mbda.berry.edu/items/show/5554.